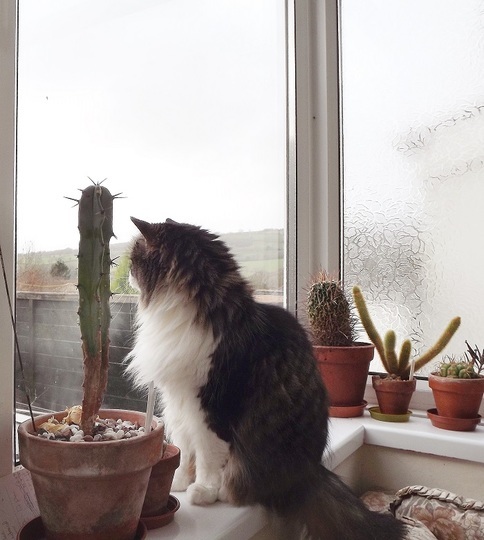 I put some of my cacti to overwinter in the conservatory because they are more tender but most of them are in a frost free Perspex shelter. Now this is what I have been missing - another pic of beautiful Bella! Where often I go to get my thrills. So I can chase a mouse or two. She is lovely and a great capture Hywel. She is such a lovely cat Hywel and looks lost in thought or could it be admiration, as she looks out onto your garden?! Oh lovely! I love cats. Can't have them, my son is allergic. Lovely Bella, day dreaming of the warmer days, and the adventures ahead. She knows she looks gorgeous from any angle. I think the older a cat gets the more she sleeps Shirley ! Megan must be a good age now. Bella is 8 and been here 6 years in May. sweet Bella. She and Rufus are nearly the same age. wanted to post one of my fav nurseries (Belgian Nursery) which has an advert on Fb. so you could see their latest sale of succulents and cacti. They have a display of barrel cacti that would make your eyes water... I shared it and tagged you...have you seen it? They have been in the same spot for many years (on Highway 24 between Guelph and Kitchener) When I was a student I used to go there and wander about for an outing. That wonderful photosynthesis-laden air...and the beautiful plants. It was a delightful respite for a poor student. have to agree with you about Fb, Hywel. oddly I found it intrusive...a little too personal. I've been skipping days and only going in once a week, gradually weaning myself. It can become habit forming, I find. Going back to the beginning I joined at the request of my grand-niece and it was a young person site. Now all my retired relatives and most of my childhood friends are on there... It's not cool for the youngsters anymore. I put a link to the Belgian Nursery in my comments. It's a quick pann around the cacti and succulent greenhouse. I saw the link, thanks. I joined a few groups on facebook and when I log in (which is not often) I just look at those.